Nixon Homes Inc. has built homes throughout Northeast Indiana, as well as southern portions of Michigan and Eastern Ohio. Homes can be built within one of our developments, or on your existing land or home site. Currently, Nixon Homes has lots available in three distinctly different developments in the Auburn, Indiana area. Hunters Glen subdivision east of Auburn, off of State Road 8, offers larger lots with wooded and daylight options. This development is like living in the country - quiet, peaceful and an overall wonderful neighborhood. The lots are extremely large with prices starting at $26,500. Duesenberg Place is a 32 lot subdivision in Southeast Auburn with lots priced from $22,000 and up. Caleb Acres on the Northwest side of Auburn offers 3 acre lots in a rural setting, close to town and easy access to Interstate 69. This development is located within the DeKalb Central School District. Prices for these generously sized lots start at $33,000. 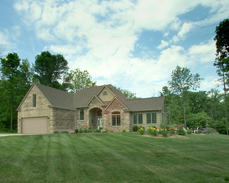 Cobblestone Golf Course, this subdivision is Located in Kendallville, Indiana. This golfing community is a wonderful place to live and is within city limits just off Drake Road. We currently have three remaining Villa Lots available beginning at $ 28,000 and up. There are also many residential lots to choose from as well.